Mattel has revealed all of their San Diego Comic-Con 2010 exclusive toys. Mo-Larr was featured in the famous (infamous?) episode featured on the DVD release of Robot Chicken Season 2 where he chased down Skeletor® and relieved him of an impacted wisdom tooth, sans numbing agent. Skeletor® features a new head with missing tooth, Havok Staff, Power Sword®, and Half Power Sword®. 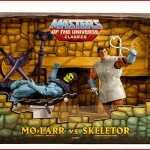 Mo-Larr, Eternian Dentist, comes with five assorted dental tools, including @#%## drill and floss. Orko® includes magic wand, stand, and magic book. This SDCC-exclusive version of Orko® changes color in warm water to all clear — except his face and the “O” on his chest. His magic book has a color-change sticker that reveals the SDCC logo. Orko® also includes a fully articulated Prince Adam® figure, complete with angry and smirk heads, purple Power Sword®, and Half Power Sword® in purple. The bio on the back of the pack is for Orko® because Prince Adam® is the accessory, Orko® is the figure! This version is identical to the one described above, except it does not have color-change features. This version will be available for purchase at MattyCollector.com after the show. All new die-cast vehicle from the hit cartoon Mater’s Tall Tales (“If I’m lyin’, I’m cryin’!”) on the Disney Channel. With “flames” shooting out the back! DCU Plastic Man has interchangeable standard arms, stretchy arms, giant form hands (a fly swatter and a bouncy ball with racket), and interchangeable stretchy neck and leg springs. This Plastic Man Suitcase is packed in a poly bag and comes free when you purchase DCU Plastic Man at SDCC (available only while supplies last). You can attach his arms, head, and neck to the suitcase as if he has disguised himself as a suitcase. Open up the suitcase and find chip art comic book covers from the 75 years of DC Comics. Looks like he’s been doing some shopping while at SDCC! The Suitcase will not be sold online after the show, but we will offer the DCU Plastic Man figure without suitcase, as shown above. This special pack commemorates the 75th anniversary of DC Comics. The Starro pack re-creates one of the most famous DC covers of all time, the cover of Brave and the Bold Issue #28, the first appearance of the Justice League and Starro the Conqueror. Comes with all five JLA members featured on the cover as highly articulated figures in the same scale as Infinite Heroes™. Includes Martian Manhunter, The Flash with added articulation, Wonder Woman (all new), Green Lantern (with construct), Aquaman (all new), and giant, bendy Starro. Box features lights and sounds with the voice of Kevin Conroy, TV’s animated Batman, describing the characters and events seen on the cover. As a bonus, and only available at SDCC as a free gift with purchase while supplies last, this poly bag of four Starro Spores is compatible with your 6″ scale DCUC figures. Starro set described above will be sold online after the show, but will not include these Spores. This set marks the first pairing of a 6″ N’avi figure with a 3-3/4″ RDA figure. Features include a new head on Jake, new broken window parts on the Amp Suit, and an all-new deco. Miles includes a gas mask. Polly Pocket™ celebrates the DC Comics 75th Anniversary in the Dressed for Justice toy. Polly™, Lea®, and Lila® are ready to make their first appearance at Comic-Con in their DC-authorized Supergirl, Batgirl, and Wonder Woman costumes. Our all-new line of Retro-Action™ The Real Ghostbusters™ figures arrives this fall, but you can get the first figure at SDCC! We’ll have an exclusive variant version of Peter Venkman™ as a spooky spirit when his outfit was possessed in episode 11 “Citizen Ghost” (variant version has all green clear skin). Best of all, Peter Venkman™ talks! Just press the button on his chest to hear four lines of his dialog from the episode. Lotso, the ridiculously adorable bear character from the new Toy Story 3 flick, is flocked and strawberry scented. The box features concept art and Toy Story trivia. Fun Fact: Before his movie character was revealed by Disney/Pixar, Lotso made an appearance in a girl’s bedroom in the trailer for the movie Up (look for Lotso by the bed as she looks out the window). This Undertaker® figure comes straight from the Hell in a Cell match (Wrestlemania 15) where he defeated The Big Boss Man! One of the most fan-demanded appearances ever of this world-champ warrior.